Kina Guyton is an experienced marketing leader who specializes in delivering exceptional consumer products and experiences that exceed company goals. Ms. Guyton has crafted the brand strategy for both emerging start up brands - BORBA and Bare Escentuals - as well as some of the world’s most recognized brands, such as Colgate Toothpaste and Walgreens. Currently, at Topco Associates, Ms. Guyton extends her creative and content experience along with brand management as Senior Director, Brand Management and Design. In 2016, in addition to leading Walgreens brand efforts, Ms. Guyton was selected as one of eight executives for the inaugural Entrepreneur in Residence program for a global venture collective supporting the social impact startup community. 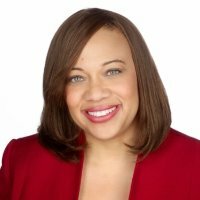 As a consultant to a FinTech startup, Ms. Guyton led the operating model and growth hacking strategies prior to launch. Ms. Guyton earned an MBA from Duke University Fuqua School of Business and a Finance degree from American University. She volunteers with In Her Shoes Foundation, as she feels the potential for this organization is limitless.